Today was as unique an Easter morning as we could ever imagine. We spent the morning in a fourth century Christian church, now a mosque, visiting with a Muslim imam and learning about his faith and his role in the community. 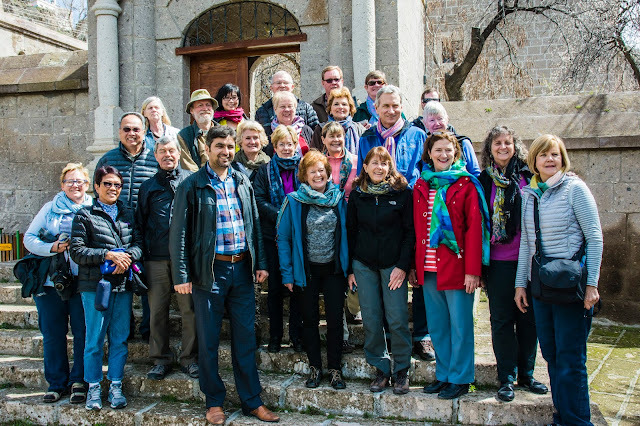 Our tour group woke to a glorious Easter morning and boarded the bus to our next stop in the ancient Cappadocian town of Guzelyert. By mid-morning, we arrived in the Monastery Valley below the town. Within this 3.4 mile (5.5 km.) 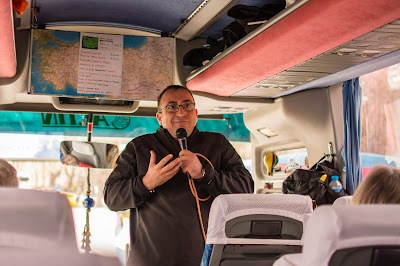 valley, there are 28 churches and ancient monasteries, two underground cities, and hundreds of cave homes, chapels, and stables carved into the cliffs. This ancient valley provided a refuge for 2nd and 3rd century Christians, who used its secluded location and rock-carved dwellings to escape persecution by the Romans, who controlled this territory from 17 A.D. until Emperor Constantine adopted Christianity. The village of Guzelyurt sits perched on the cliffs above the valley. The spring blossoms were in full bloom. This scene of a little stable built into the rocks made me think of the stable in Bethlehem. Our destination was the Guzelyurt Church Mosque, known until 1924 as the St. Gregorius Church. It was founded in 385 A.D. by Emperor Theodosius to honor Saint Gregorius of Nazianzus, who helped spread Christianity throughout Anatolia in the 4th century. Considered one of the most beautiful representations of early Christian buildings in Cappadocia, its simple stone blocks blend with the grey rocks of the cliffs on which it stands. In 1924, when the Greek population left this area in the Greece-Turkey population exchange, the church was converted into a mosque. Paint now covers the original frescoes and Christian decorations,and a minaret now stands in place of the old bell tower. Traces of the old Christian heritage can still be seen inside, however, with an old wooden pulpit still overlooking the sanctuary and the cross shape of the nave. 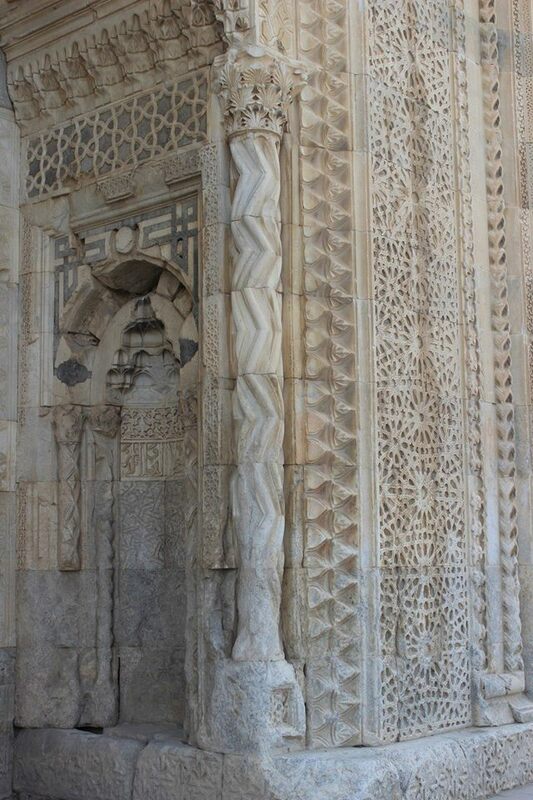 ...But its walls are now decorated with verses from the Qur'an. 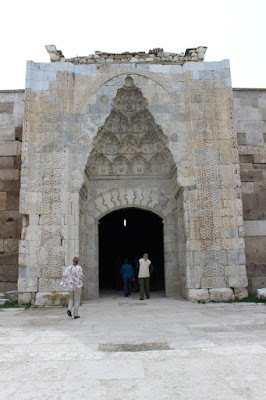 The village imam, Emir, greeted us outside the gates to the courtyard. He was delightful...a young and handsome man with a gentle and pleasant manner. Our tour guide, Mert, had told us that Emir resembles George Clooney, and he wasn't far wrong! Mert introduces us to Emir. 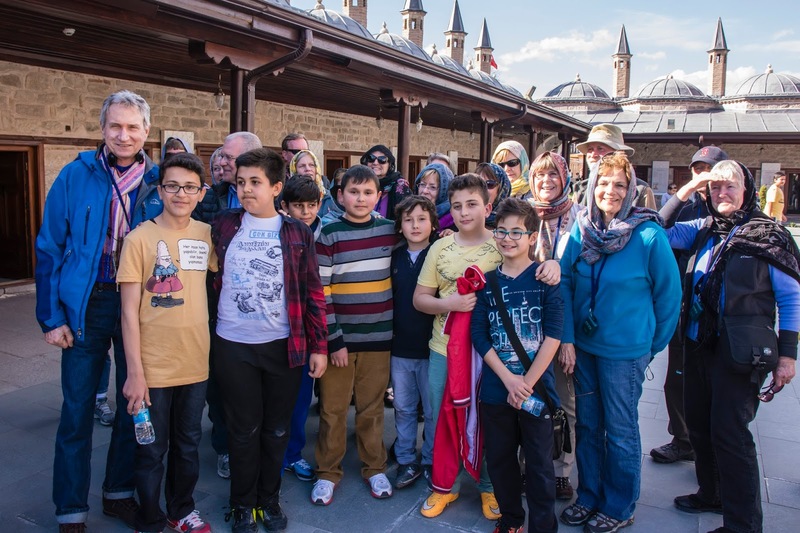 Our group gathers in the mosque courtyard. We women covered our heads and both men and women removed our shoes and entered the simple room to sit on the colorful prayer rugs covering the floor. Our group asked Emir many questions concerning Islam, about his role in the community, about the education of the children of the village, women’s rights, and more. Mert translated our questions and Emir’s answers. He confirmed what Mert had already taught us…that Turkey is a secular nation and tolerant of all religions. Emir said the moderate Muslims of Turkey (and around the world) are angry about the acts of the radical extremists, as they do not represent the beliefs of billions of Muslims and are giving Islam a bad name. He feels much of the problem arises from ignorance and illiteracy because the uneducated are vulnerable and dependent on the leadership of tribal leaders who do not correctly interpret the lessons of the Koran. Our group had many questions for Emir. Mert translates for Emir, who shared his beliefs and the life of a village imam. The ladies listen to the fascinating discussion. After the discussion, we gathered in the courtyard to say our thank yous and get some photos. This visit was one of the highlights of our trip! 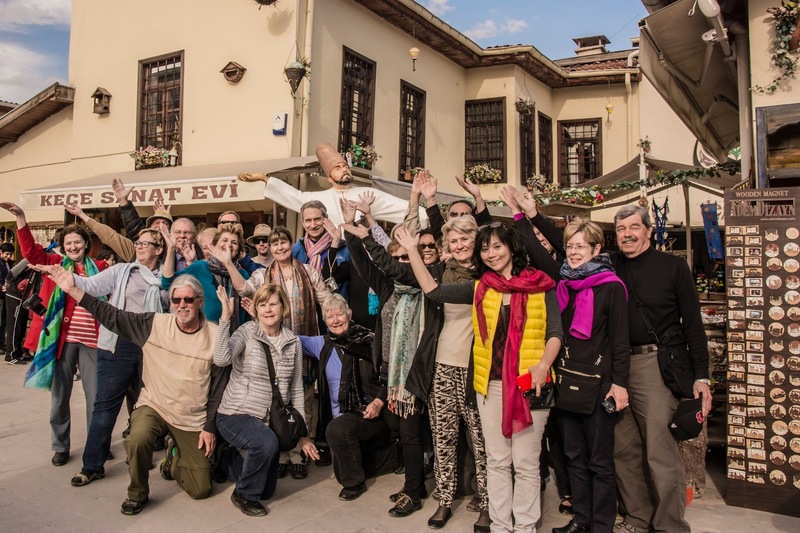 Our great fellow tour members with Emir in the courtyard of the Guzelyurt Church Mosque. The middle of the day included a long bus drive to the city of Konya. It was a pleasant trip, with beautiful views of Mount Hasan, the tallest of the string of ancient volcanoes that created the other-worldly landscape of Cappadocia. The snow-capped peaks of the 13,000 foot (4,000 meter) high mountain glistened in the sunlight. Joan and Rob on a stretch break during the long drive to Konya. Mert's bus lecture this afternoon was a fun discussion of family life in Turkey, including marriage customs. He used his own recent marriage to illustrate one of the more amusing customs of their culture. When a young man becomes engaged to a girl, he must undergo a "test" of his fitness to be a husband. During a meeting of the engaged couple's families, everyone is served coffee. The young groom-to-be must drink coffee laced with salt, rather than sugar, to show that he can handle difficult situations. When Mert and his parents met with his fiancee’s family, he was relieved when she served him delicious sweet coffee. He figured she was being good to him and secretly slipping him unsalted coffee, but it turned out that she had accidentally mixed up the cups and served the salted coffee to his father! Happily, it didn’t ruin the engagement. He and his wife recently had a darling little boy. Mert kept us informed - and amused - with his bus lectures. We stopped for lunch at another of Turkey's modern truck stops for a delicious buffet lunch, then took our next stop at the huge and well-preserved Sultanhani Caravansersai, one of the rest stops along the silk road. 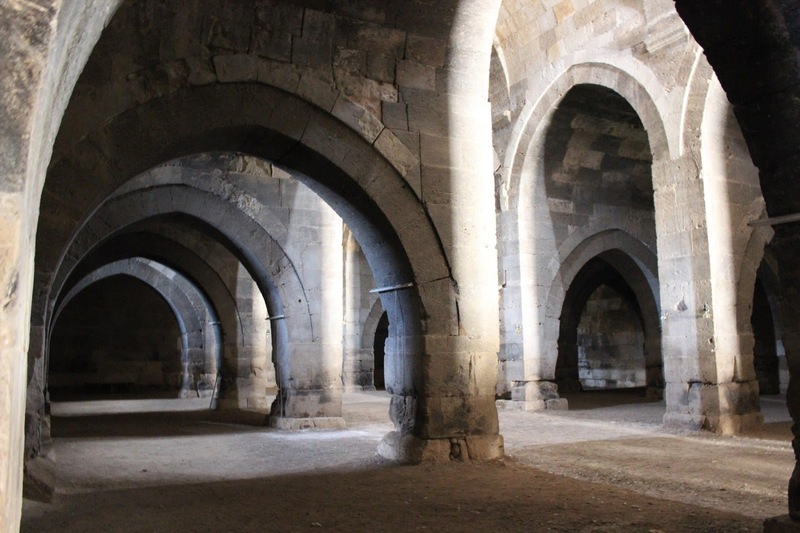 Sultanhani Caravanserai was built in 1229 A.D. by the Seljuk Turks, and it remains the largest and best preserved of this string of caravanserai. Like the missions of California, these were built at a distance apart of one day of travel, although these were spaced for one day of travel with a heavily laden camel...about 30 to 40 kilometers (18 to 25 miles) apart. 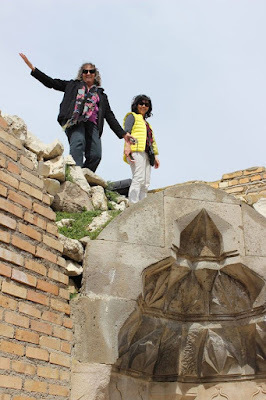 Sultanhani Caravanserai - Marco Polo slept here! 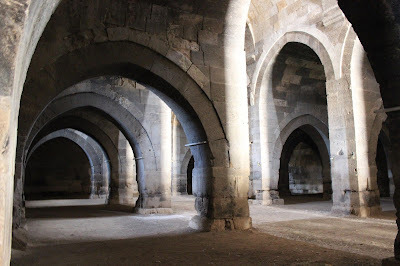 The caravanserai was built like a fortress, with high thick walls surrounding an inner compound. 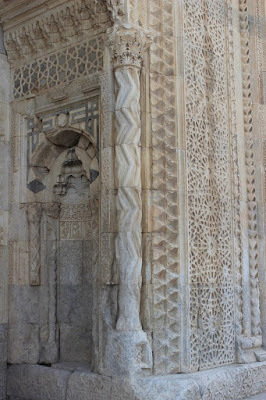 We gathered at the huge doors leading into the courtyard and examined the elaborate stone ornamentation that covers the walls while Mert gave us some history of the building. And, of course, the caravanserai came with a resident cat or two! Then we entered the large open courtyard with its mosque tower in the center. A narrow, and slightly scary, stone staircase offered access to the tower roof. There were no guardrails or warning signs on the stairs. It definitely would have not passed inspection in the United States, but we crawled to the top for views of the surroundings. Rob climbs the steep steps to the top of the tower. Around the perimeter of the courtyard stood the roofed compound where weary travelers would rest with their livestock and goods as they traveled the Silk Road. We learned that Marco Polo stayed in this very spot on his travels to the far east. (This was my second encounter with Marco Polo, as we had also visited his house on the island of Korcula in Croatia.) It is always exciting to walk in the footsteps of historical figures! We arrived in Konya, the seventh largest city of Turkey, in the late afternoon. The buildings along the highway were clean and modern, but we headed to the most important site in the city, the mausoleum of Mawlānā Jalāl ad-Dīn Muḥammad Balkhī, better known as Rumi, the Sufi mystic and poet from the 13th century. Once again, we women donned our headscarves and entered the outer courtyard of the mosque where we had a very sweet experience with two groups of students. 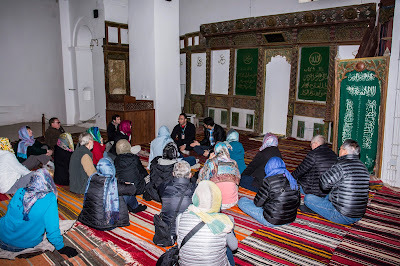 Mert read some of Rumi's teachings and told us a bit about the history of Rumi and his philosophy, along with a description of the building, which used to be the courts of Konya. As we listened, a group of young schoolboys around 10 to 12 years old approached us to practice their English. The boys were shy at first, giggling and ducking their heads, but soon opened up as we showed a friendly interest. As we were still talking to them, we were approached on the other side by four lovely young women who also wanted to have the chance to practice their English. They were delightful…all pre-med students about to take their exams to qualify for dental school. Konya is the most conservative city in Turkey, so most of the women we saw had their heads covered, including these four girls. Mert told us that back in the late '80s and early '90s, Turkey was very strict about its secular stand and women with their heads covered would not have been allowed to study at the university. The government is much more tolerant now. This sign was very interesting. I'm not exactly sure what it is asking us to do! These young pre-med students wanted to practice their English with us. Rob and I were impressed with Rumi's philosophy. His poetry and writings emphasize tolerance for all who believe in God. 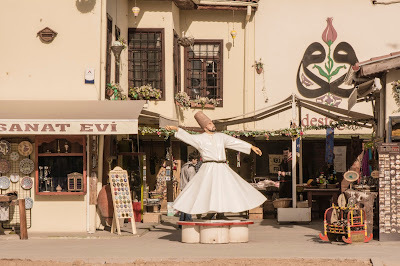 His teachings are followed by the famous Whirling Dervishes, who can be found throughout the world. Every movement of the dervish's dance has profound meaning. The dervish whirls into a meditative trance, the right hand extended up to God with the left hand facing the earth. He keeps one foot centered and rotates in a counter-clockwise direction with his head tilted at a 22 degree angle, to mimic the rotation and tilt of the earth. As he spins, he gathers the love from God in his right hand and rains it down with his left hand onto all the world. 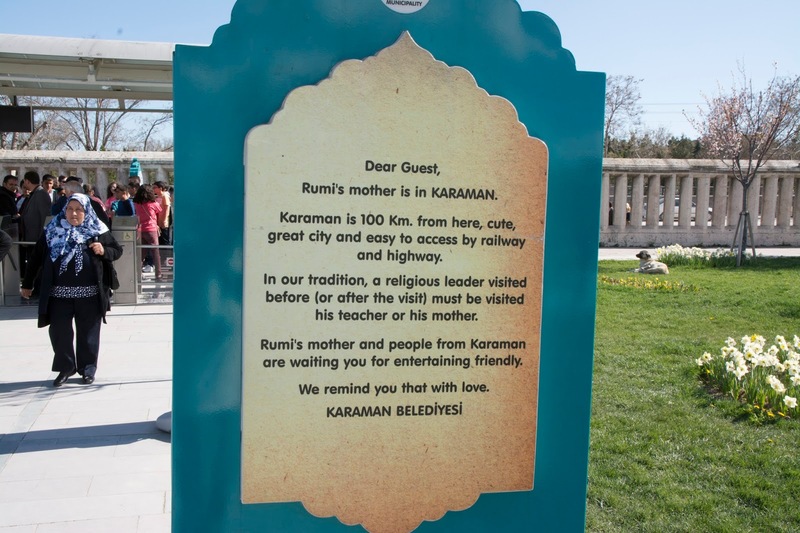 Instead of removing our shoes, as we had done at the Blue Mosque, we covered our shoes with little booties and entered Rumi's mausoleum. Elaborate designs, vivid colors, and calligraphy decorated the walls and ceiling. We observed the faithful praying behind a barred wall, men and women in separate rooms. 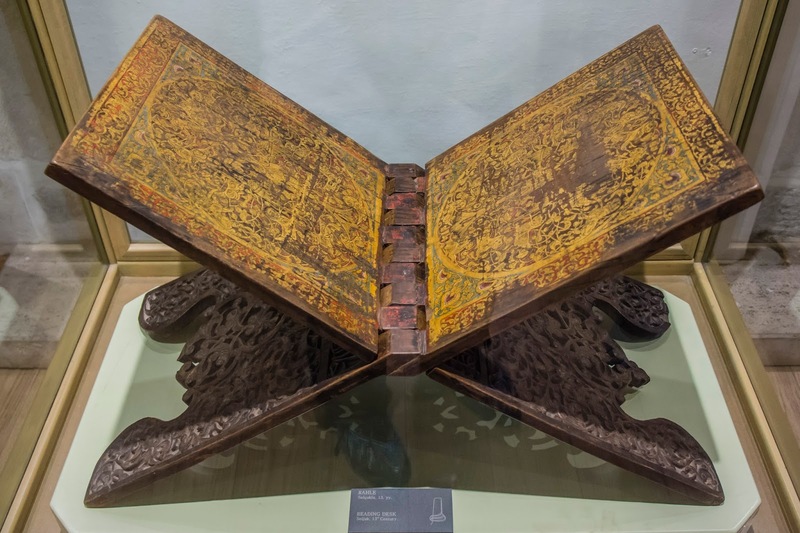 A Qur'an from 1544 A.D. was on display; its pages were decorated with calligraphy by Rumi's own daughter. 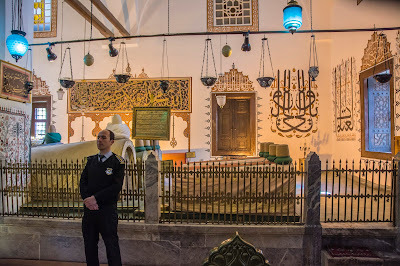 Stylized turbans topped the tomb of Rumi and some of his disciples, and we learned that the turban had a practical purpose. 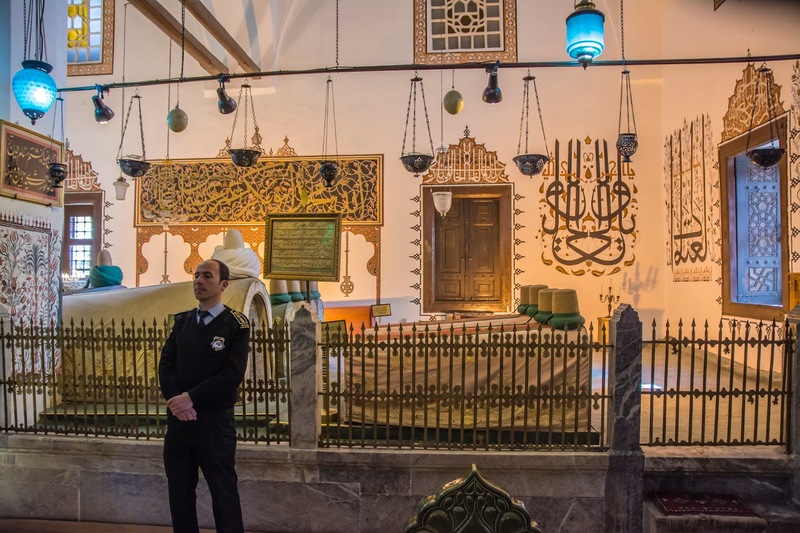 Muslims are supposed to be buried quickly in a burial shroud, and the turban was their burial shroud, carried with them just in case they died unexpectedly while traveling. It was lovely to discover that one of my favorite hymns in my own Unitarian-Universalist Fellowship is actually a poem by Rumi. The verse below is the poem as written by Rumi, and the link below that is a YouTube video of the song as sung in a round by a UU congregation. Our group is capturing the love from heaven and sharing it with you!